I’ve been writing this blog for two years, but I’ve been cooking for far longer. It’s such a fun, creative outlet for me and its almost instant gratification. You pull a few ingredients out of the fridge or pantry and a little prep work and time later you have a finished dish to share with family or friends. Then you get to do it all again, whenever you choose. I love that. Since I’ve been passionate about cooking for so long, it’s no secret amongst friends and family. That means I get lots of questions about food and recipes. I certainly don’t mind because it gives me a chance to talk about one of my favorite subjects. It also helps me realize some of the aspects of cooking that people find difficult, like using yeast and making bread. Yeast is one of those ingredients that can seem difficult, but it really is easy to use. As long as you’ve got active yeast, warm water, and a little time, you can make a fantastic yeast bread. Maybe you won’t want to attempt a sourdough or brioche right off the bat, but you’ll find yourself ready to tackle those in no time at all. 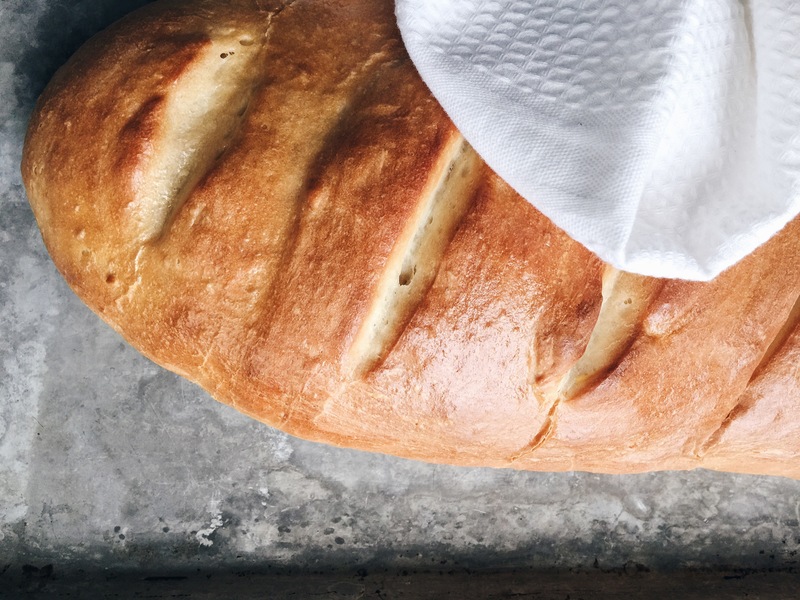 Gain a little courage by trying a simple, yet delicious, recipe like this easy French Bread. 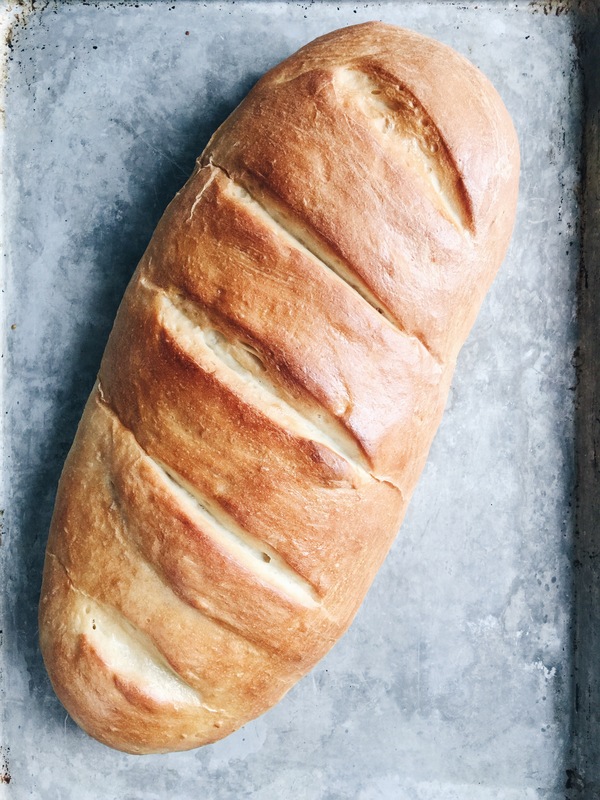 Make this if you’re just starting to bake, or if you are a seasoned baker that just wants to put a simple and flavorful loaf on the table to accompany dinner. Either way, I hope this bread finds its way to your table again and again. Place the warm water, yeast, sugar, and vinegar in the bowl of a stand mixer*. Stir to combine and let sit until foamy, about 5 minutes. Add in the salt, oil, and flour. Combine using the dough hook attachment, and knead until the dough comes together, about 3 minutes. Remove from the bowl onto a lightly floured surface and knead a few times until the dough is smooth and elastic. Place in a lightly oiled bowl and cover with plastic wrap. Let rise until doubled, about 1 hour. After the dough has risen, line a baking sheet with parchment paper. Turn the dough out onto a lightly floured surface and shape into a loaf. Place onto parchment lined baking sheet. Using a very sharp knife, cut a few slashes in the top of the loaf. Cover loosely with plastic wrap and let rise, about 30-40 minutes. Beat egg in a small bowl with 1 teaspoon water. Uncover loaf and lightly brush with the egg wash. Bake in preheated oven for 20-25 minutes or until loaf is golden and sounds a little hollow when thumped. Let cool slightly before serving. *This can also be made without a stand mixer. Place the water, yeast, sugar, and vinegar in a large bowl. Follow the instructions for letting the yeast get foamy and adding the remaining ingredients. Knead by hand for 5-7 minutes on a lightly floured surface before placing in oiled bowl to let rise. Proceed with recipe to shape and bake as directed. *Adapted from recipe found here. Thanks! Give this one a try. It’s the easiest French bread I’ve made by far! Thanks for sharing. Never realized how easy it is to make a French loaf!